Who will be India's No.4 batsman at the 2019 World Cup? It has been the question that has left everyone in Indian cricket puzzled for a long time now. 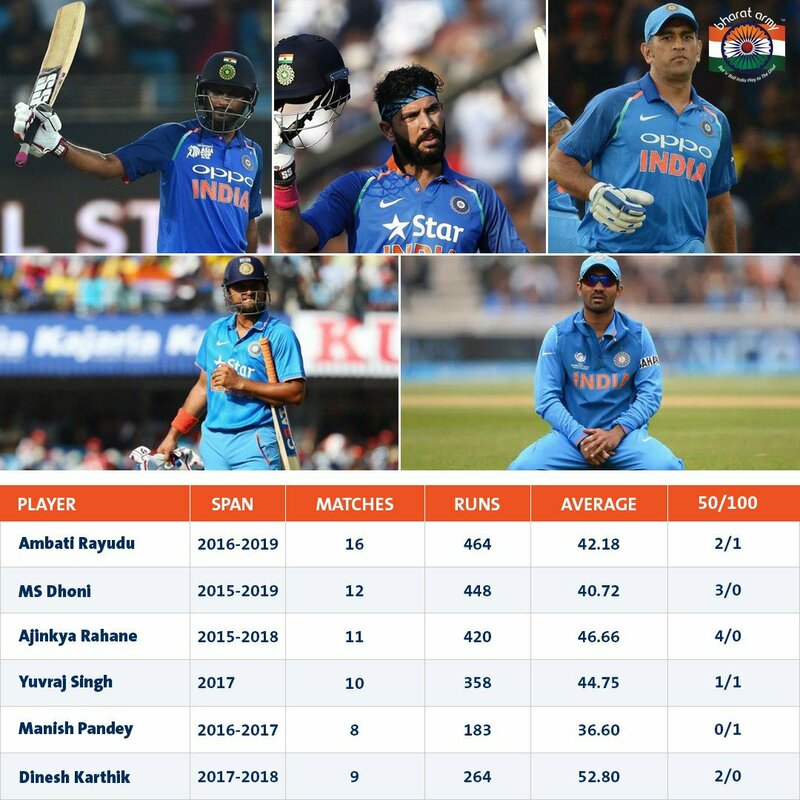 Since the 2017 Champions Trophy, India has tried as many as 11 different batsmen at the No.4 spot without much success. While the contenders haven't made use of the opportunities given to them, the team management's lack of clarity and constant experimentation haven't helped their case either. One of the casualties of the lack of clarity of the think-tank is KL Rahul. With the presence of a formidable opening pair of Shikhar and Rohit and his struggles in the limited chances at the No.4 spot [26 runs in 4 matches], Rahul- a specialist opener himself has often found himself as the backup for the duo, but such has been his talent and the pandora box of the No.4 spot open that Virat Kohli has dropped himself to accommodate the Karnataka batsman in the playing 11. It happened for the first time against England last year and also during the home series against Australia after Ambati Rayudu was dropped from the side after three poor outings. But, the move has been really inconsistent. Both in England and against Australia, the Karnataka batsman was dropped after one poor outing. But, after a resurgence in his batting form [317 runs in seven matches at 79.25] in the ongoing Indian Premier League following an extended lean patch across the format, the KXIP opener is ready to step into the shoes of whatever role Kohli and co. ask him to perform, come to the 2019 World Cup. "Wherever the team requires me and wants me to fit in, I will go and give my best. If they want me to the field, I will. If they want me to bat at No. 3, 4 or open, I will be ready as per the team's requirements. It's a team sport," Rahul said on being asked about whether he is ready to bat at the No.4 position to TOI. It is the most prestigious tournament for any cricketer in the world. It is the dream of every cricketer to represent the country in the World Cup. It will be a brilliant opportunity.” said Rahul in an exclusive chat to Times of India. That said, Rahul is not fretting over the World Cup selection and is currently focused on the job at hand. "World Cup selection is not in our hands. For now, my focus is on IPL. I want to score as many runs for my team (KXIP). I am not thinking and worried about it (World Cup selection). If I get a chance, I will give my best," Rahul claimed. The much-awaited squad announcement of the Indian cricket team for the World Cup will take place on the 15th of April which will offer an insight as to what the playing 11 for the first game on the 6th of June will look like. Virat Kohli and MSK Prasad have time and again asserted that performance in the IPL will not be taken into account while announcing the World Cup squad. While it is true that the format and stage are completely different, history has time and again showed that often form and confidence rubs off across formats, which might just work in Rahul's favour.